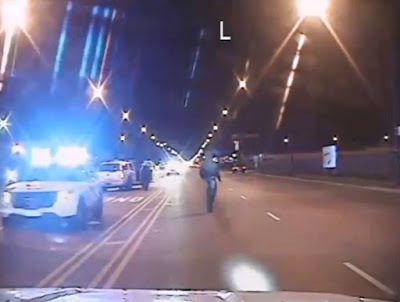 Jared Unzipped: Video Shows Laquan McDonald Murdered By Chicago Police Officer. Video Shows Laquan McDonald Murdered By Chicago Police Officer. Just within the past hour, dash cam footage of the altercation leading to the death of seventeen year old Laquan McDonald was released by court order. Below is the police video of that incident. Warning -- this is not for children to watch. The altercation begins in this video around the 5:20 mark. On October 20, 2014, Chicago police officers responded to McDonald, whom was reportedly stealing radios. While I certainly don't believe McDonald to have been innocent in the matter (he had a knife in his possession), his execution certainly was not called for. McDonald deserved his day in court before a jury of his peers, just like any other American, whether guilty or innocent. His death was not necessary, nor do the police possess the right to administer capital punishment. Officer Jason Van Dyke initially fired a shot which put McDonald on the ground, incapacitated. For the next thirteen seconds, Van Dyke continued to fire into McDonald's lifeless body, without any threat of bodily harm whatsoever. A fellow officer on the scene finally convinced Van Dyke to not continue reloading his weapon and resume firing. Van Dyke claimed that McDonald lunged at him with a knife, causing him to feel threatened and fire his weapon. As you can see from the video, this simply is not the case. I ask that you watch this video and form your own opinion on the matter, free from the influence of outside sources, your friends or family. THINK FOR YOURSELF. Upon doing so, I believe you'll agree that the police are clearly capable of murder. The police are not always in the right one-hundred percent of the time. The police can and do exercise unnecessary force, not just in the case of McDonald, but all across this country. Again, let me reiterate. I'm not saying McDonald was innocent, but he didn't deserve to be put down like a dog in the street. There could have been a more peaceful solution which didn't end in blood. Why are moments like this important for the public to process and understand? We have to prevent such barbaric behavior from becoming commonplace for the police. As much as the police serve and protect the common good, they must also remember that they work for the public. The police are not our prison guards. They are not our shepherds. Most importantly, they are not our executioners. If we give the police an inch on this matter, then I fear we teeter on the verge of fascism. To protect the rights of the innocent, we must also protect the rights of the guilty. Otherwise, the police will be coming for you and I next. I hope this Thanksgiving holiday is peaceful for the city of Chicago, but I fear for the worst.